We’ve kept very busy lately! We’ve worked very hard to complete our new Outdoors & Lifestyle catalog and it is now finished! We hope this provides everyone with plenty of information on our DoggyRide dog bike trailers and dog strollers, DoggySnooze elevated dog beds, Dutch Dog Amsterdam eco-friendly collars and leashes, our values and mission, and more! Please take a look and share your thoughts. Neil Sedaka once sang, “breaking up is hard to do” but, is it as hard as leaving your precious pooch at home while you go to work every morning? Surely with that sweet face and those beady little eyes, it is just as hard. A sign of the times, more and more workplaces are recognizing the health and business benefits of bringing dogs to work and slowly across America, more workplaces are filled with 2-legged workers and their 4-legged canine companions. Now, with dogs by their sides, employees need not fret over how their pooches are doing at home, alone. Bringing dogs to work can improve an employee’s health by reducing stress, reducing cortisol levels and increasing happiness. It is also important to remember and consider a dog’s health when bringing it to work, though. Dogs sleep anywhere from 12 to 18 hours per day, or 50% to 75% of the day. With so much lying around going on, it’s important for a dog to have a healthy and comfortable dog bed on which to rest and sleep. When sleeping, some dogs like to stretch out and lay against something, others like to curl into a corner, and some like to rest their heads on something soft and elevated. Remember all those times your dog fell asleep next to you on the couch with its head propped on your lap? 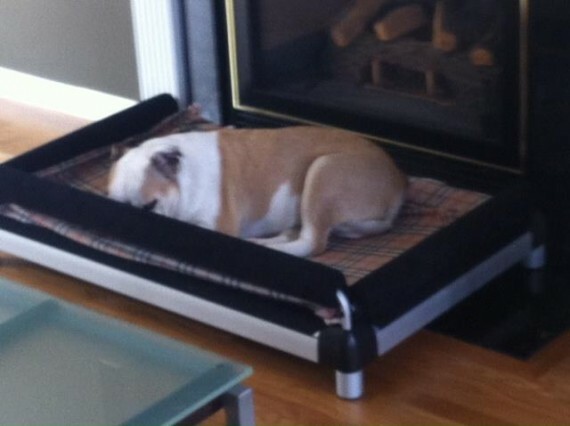 Elevated dog beds are an excellent, healthy option for your dog’s bed. DoggySnooze beds, for example, are elevated which means that your pal doesn’t have to sleep on the floor, while also increasing air flow around the bed and the dog helping to reduced condensation and keep a dog cool and dry, and keep the floor around the bed much cleaner. The snoozePad and snoozeSleeper dog bed models come with bed layers for the dog to sleep on with the option to add a 1” thick orthopedic memory foam mattress as well, while the snoozeLounge and snoozeSofa dog bed models come with the 1” thick orthopedic memory foam mattress standard. Having a healthy back and spine isn’t just a human thing, it’s a dog thing too. 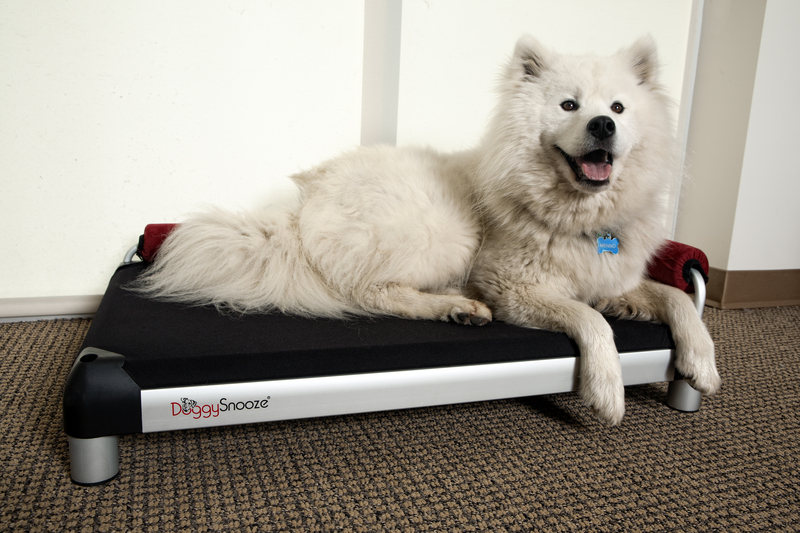 For those of you who are looking for multiple customization options, designs abound with DoggySnooze beds. Elevation options, bed layer color options and bolster color options can be made to fit with most any office’s décor. The bed elevation can be changed from short to tall. For dogs that like to stretch against something while sleeping, a bed with one back bolster is an excellent option as it provides a comfortable place to rest with the addition of a support to lay against and open sides to allow for plenty of sprawling. 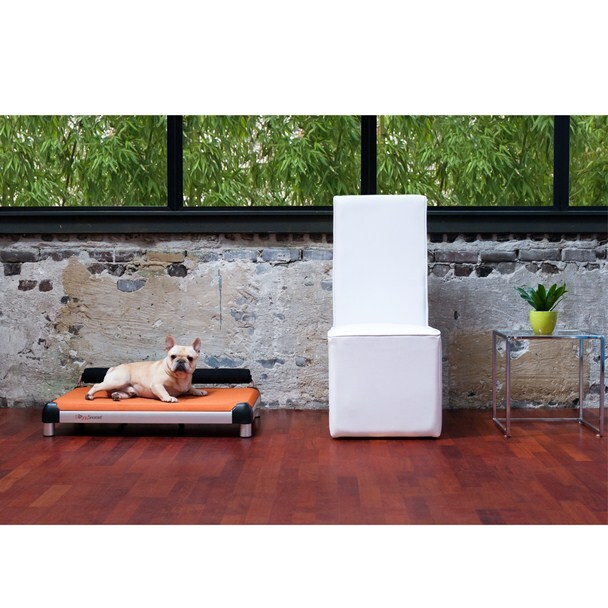 On the other hand, if you’ve got a dog that likes to snuggle into corners and sometimes rest its head on something, a bed with a side and back bolsters is a great option as the side and back bolsters offer multiple options for places to snuggle and many places where a dog can rest its head. Going out for a doggy break will give both of you a bit of mid-morning or mid-afternoon exercise and time to get outside for some fresh air. Don’t forget some tasty treats and terrific toys to help keep your dog entertained during the day. Also don’t forget to mind your doggy’s manners when back indoors. Keep him on a leash when not inside your office or cubicle as to not disrupt other office mates and remember to keep Fido secured during those meeting or conference calls. Chief Inspirational Officer, product tester, chaser of dog treats and master burying treats for a rainy day, Menno the smiling Samoyed is a wonderfully fun office mate. 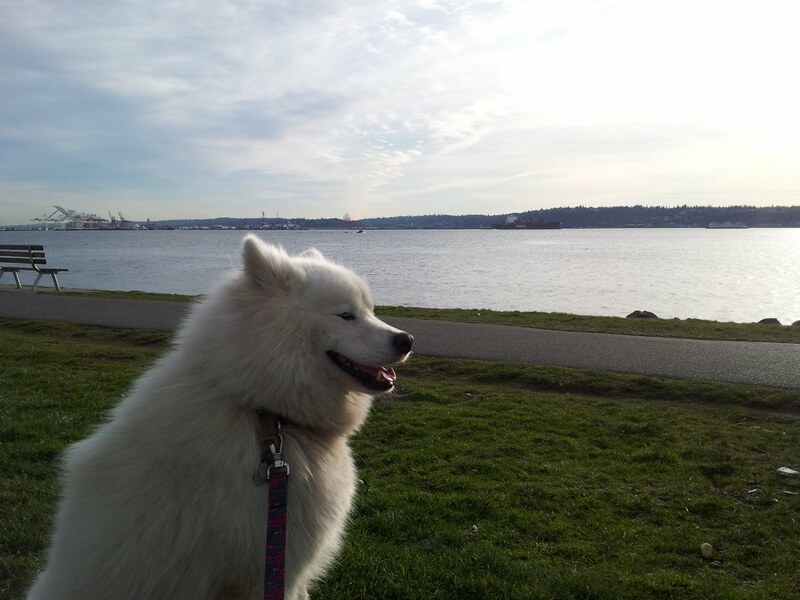 Menno enjoys the sights and sounds of Elliott Bay in Seattle. Menno is a sprightly Samoyed whose human companion is Dutch Dog Design owner and designer, Matthys van Leeuwen. 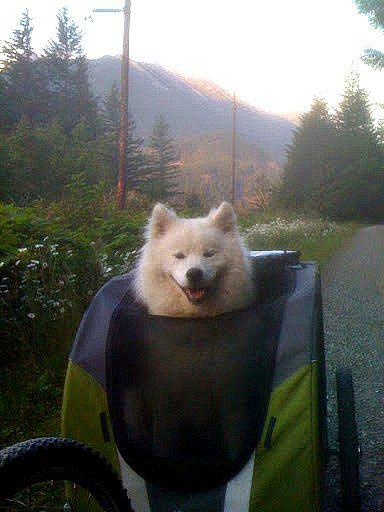 This spunky Samoyed enjoys plenty of hiking and biking with his people. Day and night, Menno gets to test out the DoggySnooze dog beds and with that, inspire product innovations and redesigns. In fact, the DoggySnooze snoozeSleeper was inspired by Menno’s love of sprawling out in his sleep and desire to rest against something. The elevation of the snoozeSleeper allows for Menno to not have to sleep on the floor and experience increased airflow under the bed and around his body, keeping his fluffy body cool, dry, and comfortable while also reducing condensation. The interior foam, and optional additional memory foam give him a healthy and orthopedic place to rest and be comfortable. 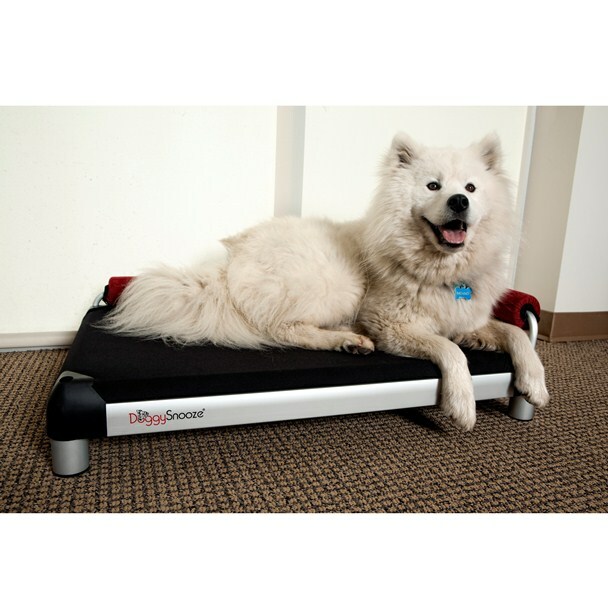 Read more about the benefit of orthopedic dog beds. On weekends, Menno enjoys exploring the parks and trails of the beautiful Pacific Northwest with his owners while riding in his DoggyRide Novel dog bike trailer. With his own personal sunroof unzipped, he can enjoy the fresh air and wind in his fur just like any dog should. Many afternoons are then spent hiking and exploring the trail, chasing after a few sticks and even meeting some new furry friends. Menno enjoy the beautiful views and fresh air from his DoggyRide Novel dog bike trailer. When venturing out for a stroll to the local dog park a bit closer to home, Menno enjoys accompanying his avid bike rider owner. 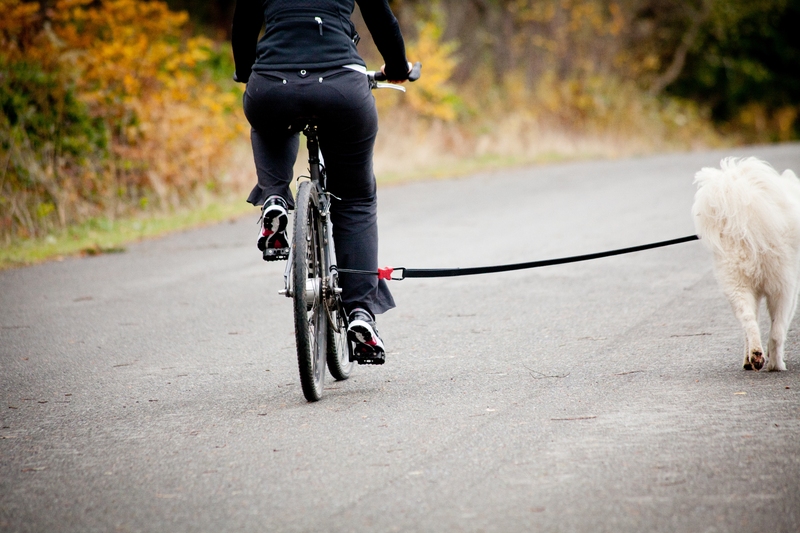 Without the necessity of a trailer for longer trips, Menno is safely attached to his owner’s bike via the Buddy hands free dog leash connector. This way, his owner can focus on safely riding his bike, without having to focus on leading a dog on a leash in his hands at the same time. With the Buddy, Menno is once again fulfilling his duties as Chief Inspirational Officer as he also inspired this product’s creation. Seeing that Menno was afraid of using a different, more obtrusive dog leash connector, his owner decided to craft something that was easier to use with a much simpler design. The Buddy can be looped onto a bicycle, belt loop or backpack while its other end is clipped to a dog’s leash. The Buddy’s bungee material will absorb part of the pull and shock if Menno happens to get a bit too distracted by a wayward squirrel. Upon arriving at the dog park, Menno’s leash is unclasped from the Buddy and the bike and he can go roam the grassy fields with his other doggy pals. Many there’s even a game of pick-up frisbee going on, too? Menno enjoys a jog as his owner enjoys a bike ride. The fun doesn’t stop when it’s time to go back to the office. Menno enjoys spending some time outdoors playing with doggy toys and digging up his little buried treasures. He’s even made friends with local delivery drivers who “throw him a bone” which is in all actuality, a tasty doggy treat if he’ll open the front door. Just kidding! Menno gets excited to see his delivery driver pals and will either greet them excitedly or wait patiently to receive a treat. 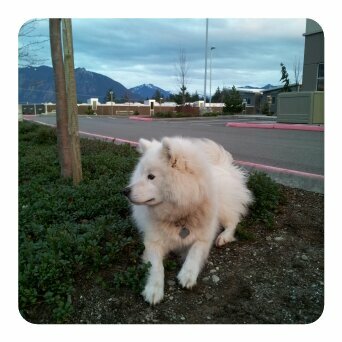 As you can see, the life of Menno the smiling Samoyed dog is rather arduous, don’t you think? Eat, sleep, treat, repeat; head out for a doggyride somewhere in between? I wouldn’t mind trading places with him for a day. Thanks, Menno, for being such a delightful canine companion. Learn more about Samoyed dogs with this helpful Animal Planet Dogs 101 – Samoyed video. Team DoggySnooze enjoys reading about how much dogs are enjoy their new, comfortable, elevated dog beds. Here’s a recent article from JustLuxe.com detailing how Bertha is having a grand time with her new DoggySnooze snoozeSofa. 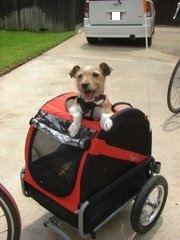 Young or old, big or small, just about anyone and any dog can enjoy DoggyRide trailers and strollers. Mark Solow, and avid bike rider and DoggyRide enthusiast in Texas shares his story about how biking with the DoggyRide has helped both him and his dog make new friends and increase visibility for his local cycling group. Mark has also gotten healthier and lost weight with the increased use of his bike and the DoggyRide. Read on for more of Mark Solow’s story with 6 key takeaways on riding with the DoggyRide. We hope that his adventures with his dog Roxy inspires you to continue to ride and explore with your dog and the DoggyRide as well. Q1.What motivated you to originally purchase your Mini dog bike trailer? A1. We took our dog on walks daily until we got into biking. My wife and I fell in love with biking again (we call it “rebiking”) in our 50s over a year ago. We wanted to still be able to get exercise and include our dog. Now we take our dog on adventures. She loves it more than walks! Q2. What have you enjoyed most about the product? A2. Since most of our bike riding is shorter trips, usually under 7 miles, it allows me to get more exercise in a shorter distance. i.e. pulling a trailer is like running with ankle weights. That’s my favorite thing. 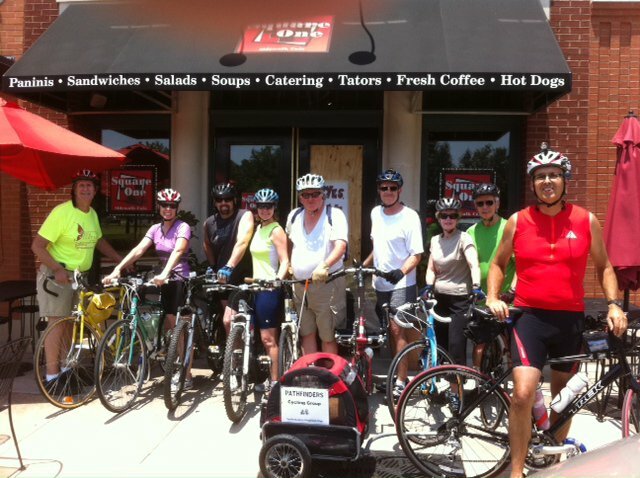 We also love to talk to people we meet along the way and in our biking group. Roxy in her Mini DoggyRide has become our group mascot. We try to bike whenever we can (grocery store, bank, hair salon, hardware store, dental appointments, restaurants, etc.) 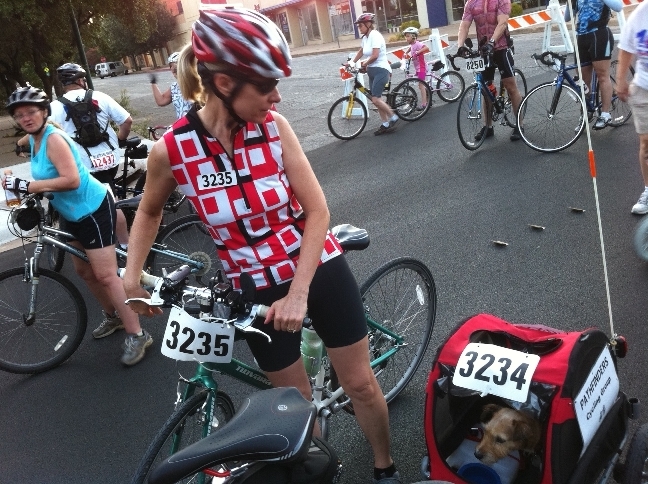 and it is very unusual for us not to include our dog wherever we can bike. Q3. What have you enjoyed least about the DoggyRide? A3. We love the way the Mini is designed. We love and use the large rear pocket and the water bottle holder. We love the balance and overall design. We are in Texas. In the summer I wish there was some sort of on-board water dispenser that was splash-proof. The good news here is that we’re currently working on finding an effective way to add an on-board water dispensation system. Q4. What kind of other experiences or reactions has riding with the DoggyRide trailer elicited? A4.My wife and I rode in the 30th Annual Hotter‘N Hell bike rally in Wichita Falls, TX last August (along with over 13,000 others). Roxy and the trailer were a huge hit. We can’t wait to take her to more events like this. We know that whenever we go to either of the local pet stores (PetSmart, Petco) that we will need to plan on spending more time because dog owners there always want to talk to us. Ruth and Roxy are ready to tour with their DoggyRide Mini! The DoggyRide is a great conversation starter and tool with which to break the ice and hopefully make new friends! Q5. How has riding with the trailer and your dog improved the overall enjoyment of your biking experience? A5. Adding the dog to our biking experience has made biking so much more enjoyable. Our dog gets so excited to go when we say, “You want to go in your trailer?”. I am always looking for errands to run. I’ve lost over 20 lbs. 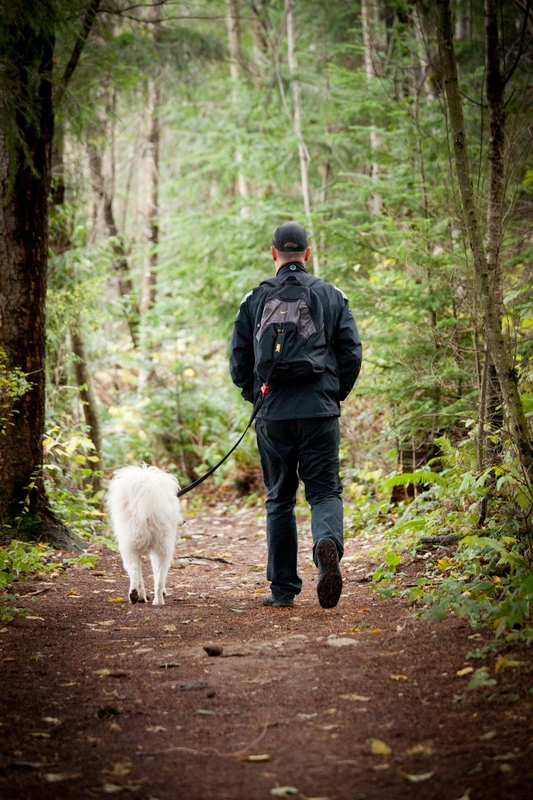 We love hearing how owners have grown to enjoy exercise even more — now even with their pets in tow! Better still is hearing about happy owners’ improved health! Q6. What other information/tips/details would you like to share with other consumers who may be considering buying a DoggyRide trailer or stroller? A6. I can’t speak to the stroller. That makes sense to me for someone who may not bike and has a really old dog or one with a disability that can’t go on a walk on their own. Or, maybe for a runner/jogger who wants to include their dog in their routine like we do. Since we organize weekly group rides (see www.facebook.com/cyclehighlandvillage click on “Events” to see past events), unlike other riding groups, we are anything but routine. We like to change the route and destination every week. Sometimes that involves what we call a “drive and drop”. We drive our cars to a starting destination and ride our bikes from there. I love how easy and quick it is to fold up the trailer so we can easily fit it in our car and include Roxy. Other DoggyRide owners who drive hatchback or SUV vehicles may be happy to know that DoggyRide trailers can also be used as a carrying crate in the back of the car once the wheels are easily removed to allow for a dog to continue to ride safely, comfortably and in style, in the back of the car. 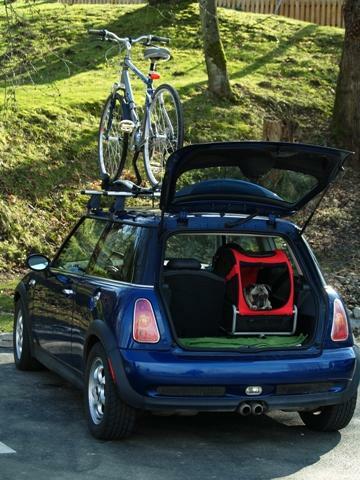 The DoggyRide trailer converts to a tent or crate for the back of the car. Learn more about DoggyRide product on our website at www.doggyride.com, ‘Like’ us on Facebook at www.facebook.com/doggyride and feel free to tweet us at www.twitter.com/doggyride. You can learn more about Mark and his Texas cycling group, Cycle Highland Village, on their Facebook page: www.facebook.com/cyclehighlandvillage. They also have a Facebook Group for cycling members and interested parties to use for discussions and sharing of news, stories, etc. Cycling Highland Village takes a break for a photo. Photos courtesy of Mark Solow and DoggyRide. Recently, the DoggyRide team from Dutch Dog Design had the pleasure of heading out to the dog park for an afternoon of fun, sun and photography. We’re excited to begin the process of bringing you a new DoggyRide product, helping you and your dog to more fully enjoy the outdoors together, within the next few months. But, before we do so, we had to take some fun photos. Menno enjoyed his time outdoors, strolling in the sun, meeting other dogs, and of course, modeling some of our other products. 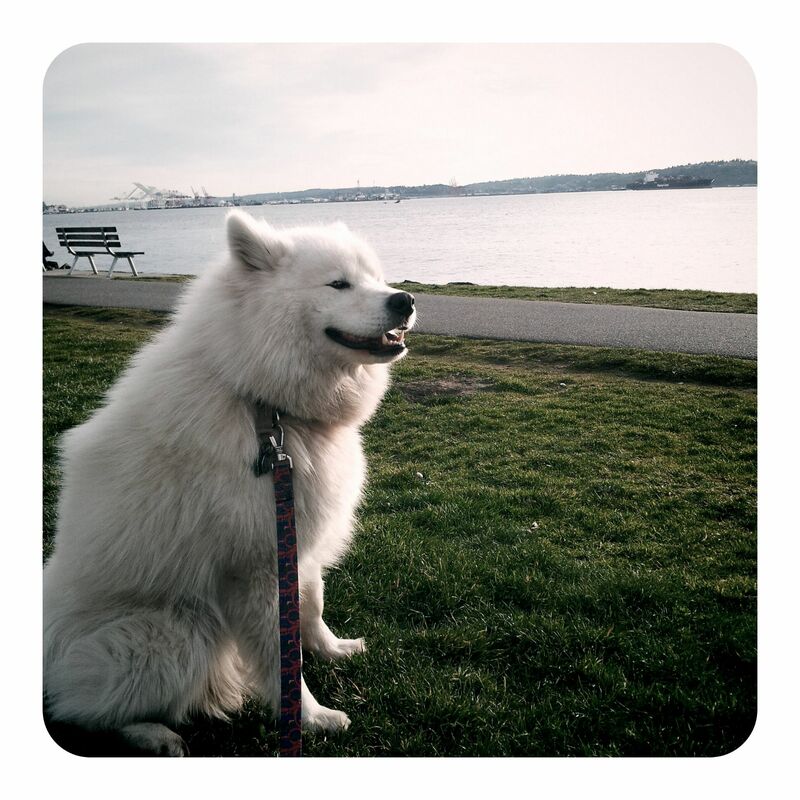 Here are a few photos of Menno enjoying a sunny Sunday afternoon at the park along the waterfront in Seattle, modeling a few Dutch Dog Amsterdam leashes to boot. Menno deep in thought.. about dog treats?